The Isco 5800 refrigerated sampler is a user-friendly device that is easy to control and use on-site for stationery sampling. It consists of a powerful compressor which delivers energy efficient, high performance cooling and comes complete with four stored programs. The integrated controller actively regulates and displays the sample compartment temperature and even logs a 24 hour summary to confirm correct sample cooling. Results can then be displayed via download or viewed on the unit display. The sampler is tough in the field whilst being environmentally friendly, the double-walled insulated LLDPE cabinet protects from exposure to weather and harsh environments. The walls are filled top to bottom with insulation for efficient temperature control for keeping samples cool in hot, humid conditions and has heaters to keep samples from freezing in cold conditions. All units are coated with a heat-treated polyester powder coating to protect the refrigeration system from corroding in treatment plant conditions ensuring long life and reliability. Standard features of the Isco 5800- refrigerated sampler are an operating range of -20 to 120°F (-29 to 49°C) without the use of additional heaters, four digital alarm outputs, lifting handles for easy installation and the display will indicate any errors. The proven peristaltic pump is used to deliver samples at the EPA - recommended line velocity at a minimum of 2ft/s (0.6m/s), even at head heights up to 25 feet (7.6m). Volume accuracy is guaranteed by the pump revolution counter and Isco's liquid detection system. When pump tubing requires replacement it is a simple process requiring no tools, whilst a safety interlock disables the pump during tube replacement for assured safety. The Isco 5800 Refrigerated Sampler is now MCERTS certified meeting the Environment Agency's performance requirements. View downloads for certificate. 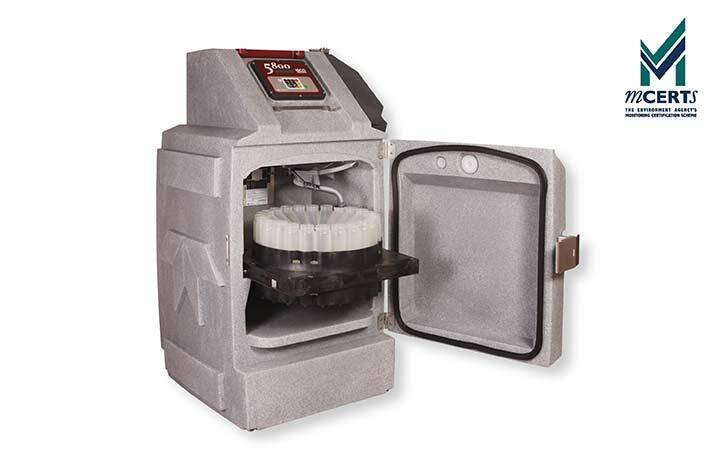 Versatile sampling modes make the 5800 ideal for wastewater compliance monitoring. Uniform time intervals - Uniform sample volumes. Material Vinyl or FEP-lined PE. whichever is greater, at lifts up to 25 ft.
compensate for changes in head heights. contact closure for Isco flow meters. 4-20 mA input for non-Isco flow meters. increments. 1 to 9,999 flow pulses. by external flow meter signal).